Everything Dinosaur have introduced a lovely, colourful soft toy of everybody’s favourite dinosaur Tyrannosaurus rex! Standing some thirty-two centimetres high and measuring an impressive forty-eight centimetres in length, this dinosaur soft toy is certainly an impressive size. A large, blue T. rex soft toy. T. rex might have been the “tyrant lizard king”, but he has never looked so cute, we love the patterns on this big dinosaur’s sides and the care taken in giving him (or her) a set of fearsome teeth. The colour of dinosaurs has been hotly debated and if you had been in North America towards the very end of the Cretaceous you might have seen a living Tyrannosaurus rex. Surprisingly this seven tonne behemoth might have been covered in a coat of shaggy feathers. The company’s buying team take great pride in choosing really tip-top dinosaur soft toys and the current range includes pink Triceratops, red Spinosaurs and green and brown Stegosaurs – what an eclectic and very colourful collection. 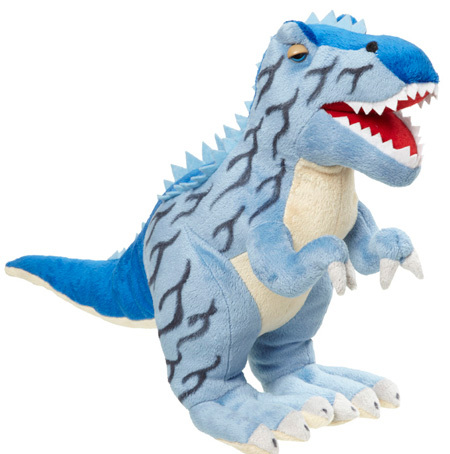 A blue Tyrannosaurus rex soft toy. These dinosaur soft toys are suitable for children from one month and upwards and we love the way the eye looks like it is watching you warily. Perhaps this dinosaur is going to attack, but he looks just to cuddly to be dangerous, unlike the actual dinosaur. Tyrannosaurus rex could have swallowed a child whole, such was the size of this Theropod’s jaws. Now there’s a thought!